It has been suggested that this article be merged into Relative density. (Discuss) Proposed since August 2018. Not to be confused with specific weight. This article is about the measurement using water as a reference. For a general use of specific gravity, see Relative density. For the property implied by "specific", see Intensive property § Specific properties. Specific gravity is the ratio of the density of a substance to the density of a reference substance; equivalently, it is the ratio of the mass of a substance to the mass of a reference substance for the same given volume. Apparent specific gravity is the ratio of the weight of a volume of the substance to the weight of an equal volume of the reference substance. The reference substance for liquids is nearly always water at its densest (at 4 °C or 39.2 °F); for gases it is air at room temperature (20 °C or 68 °F). Nonetheless, the temperature and pressure must be specified for both the sample and the reference. Pressure is nearly always 1 atm (101.325 kPa). Temperatures for both sample and reference vary from industry to industry. In British beer brewing, the practice for specific gravity as specified above is to multiply it by 1,000. Specific gravity is commonly used in industry as a simple means of obtaining information about the concentration of solutions of various materials such as brines, hydrocarbons, antifreeze coolants, sugar solutions (syrups, juices, honeys, brewers wort, must, etc.) and acids. Being a ratio of densities, specific gravity is a dimensionless quantity. The reason for the specific gravity being dimensionless is to provide a global consistency between the U.S. and Metric Systems, since various units for density may be used such as pounds per cubic feet or grams per cubic centimeter, etc. Specific gravity varies with temperature and pressure; reference and sample must be compared at the same temperature and pressure or be corrected to a standard reference temperature and pressure. Substances with a specific gravity of 1 are neutrally buoyant in water. Those with SG greater than 1 are denser than water and will, disregarding surface tension effects, sink in it. Those with an SG less than 1 are less dense than water and will float on it. In scientific work, the relationship of mass to volume is usually expressed directly in terms of the density (mass per unit volume) of the substance under study. It is in industry where specific gravity finds wide application, often for historical reasons. where ρsample is the density of the sample and ρH2O is the density of water. where WA,sample represents the weight of the sample measured in air and WA,H2O the weight of water measured in air. where g is the local acceleration due to gravity, V is the volume of the sample and of water (the same for both), ρsample is the density of the sample, ρH2O is the density of water and WV represents a weight obtained in vacuum. The density of water varies with temperature and pressure as does the density of the sample. So it is necessary to specify the temperatures and pressures at which the densities or weights were determined. It is nearly always the case that measurements are made at 1 nominal atmosphere (101.325 kPa ± variations from changing weather patterns). But as specific gravity usually refers to highly incompressible aqueous solutions or other incompressible substances (such as petroleum products), variations in density caused by pressure are usually neglected at least where apparent specific gravity is being measured. For true (in vacuo) specific gravity calculations, air pressure must be considered (see below). Temperatures are specified by the notation (Ts/Tr), with Ts representing the temperature at which the sample's density was determined and Tr the temperature at which the reference (water) density is specified. For example, SG (20 °C/4 °C) would be understood to mean that the density of the sample was determined at 20 °C and of the water at 4 °C. Taking into account different sample and reference temperatures, we note that, while SGH2O = 7000100000000000000♠1.000000 (20 °C/20 °C), it is also the case that SGH2O = ​6999998203000000000♠0.998203⁄6999999840000000000♠0.999840 = 6999998363000000000♠0.998363 (20 °C/4 °C). Here, temperature is being specified using the current ITS-90 scale and the densities used here and in the rest of this article are based on that scale. On the previous IPTS-68 scale, the densities at 20 °C and 4 °C are 6999998207100000000♠0.9982071 and 6999999972000000000♠0.9999720 respectively, resulting in an SG (20 °C/4 °C) value for water of 6999998234300000000♠0.9982343. 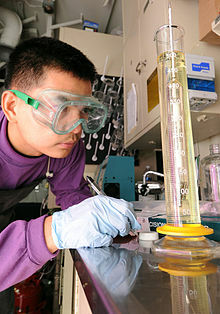 As the principal use of specific gravity measurements in industry is determination of the concentrations of substances in aqueous solutions and as these are found in tables of SG versus concentration, it is extremely important that the analyst enter the table with the correct form of specific gravity. For example, in the brewing industry, the Plato table lists sucrose concentration by weight against true SG, and was originally (20 °C/4 °C) i.e. based on measurements of the density of sucrose solutions made at laboratory temperature (20 °C) but referenced to the density of water at 4 °C which is very close to the temperature at which water has its maximum density ρH2O equal to 999.972 kg/m3 in SI units (6999999972000000000♠0.999972 g/cm3 in cgs units or 62.43 lb/cu ft in United States customary units). The ASBC table in use today in North America, while it is derived from the original Plato table is for apparent specific gravity measurements at (20 °C/20 °C) on the IPTS-68 scale where the density of water is 6999998207100000000♠0.9982071 g/cm3. In the sugar, soft drink, honey, fruit juice and related industries sucrose concentration by weight is taken from a table prepared by A. Brix which uses SG (17.5 °C/17.5 °C). As a final example, the British SG units are based on reference and sample temperatures of 60 °F and are thus (15.56 °C/15.56 °C). Occasionally a reference substance other than water is specified (for example, air), in which case specific gravity means density relative to that reference. Specific gravity can be measured in a number of value ways. The following illustration involving the use of the pycnometer is instructive. A pycnometer is simply a bottle which can be precisely filled to a specific, but not necessarily accurately known volume, V. Placed upon a balance of some sort it will exert a force. If we subtract the force measured on the empty bottle from this (or tare the balance before making the water measurement) we obtain. This is called the Apparent Specific Gravity, denoted by subscript A, because it is what we would obtain if we took the ratio of net weighings in air from an analytical balance or used a hydrometer (the stem displaces air). Note that the result does not depend on the calibration of the balance. The only requirement on it is that it read linearly with force. Nor does SGA depend on the actual volume of the pycnometer. Further manipulation and finally substitution of SGV, the true specific gravity (the subscript V is used because this is often referred to as the specific gravity in vacuo), for ρs/ρw gives the relationship between apparent and true specific gravity. Since the density of dry air at 101.325 kPa at 20 °C is 6997120499999999999♠0.001205 g/cm3 and that of water is 6999998203000000000♠0.998203 g/cm3 the difference between true and apparent specific gravities for a substance with specific gravity (20 °C/20 °C) of about 1.100 would be 6996120000000000000♠0.000120. Where the specific gravity of the sample is close to that of water (for example dilute ethanol solutions) the correction is even smaller. This technology relies upon Pascal's Principle which states that the pressure difference between two points within a vertical column of fluid is dependent upon the vertical distance between the two points, the density of the fluid and the gravitational force. This technology is often used for tank gauging applications as a convenient means of liquid level and density measure. This type of instrument requires a vibrating element to be placed in contact with the fluid of interest. The resonant frequency of the element is measured and is related to the density of the fluid by a characterization that is dependent upon the design of the element. In modern laboratories precise measurements of specific gravity are made using oscillating U-tube meters. These are capable of measurement to 5 to 6 places beyond the decimal point and are used in the brewing, distilling, pharmaceutical, petroleum and other industries. The instruments measure the actual mass of fluid contained in a fixed volume at temperatures between 0 and 80 °C but as they are microprocessor based can calculate apparent or true specific gravity and contain tables relating these to the strengths of common acids, sugar solutions, etc. The vibrating fork immersion probe is another good example of this technology. This technology also includes many coriolis-type mass flow meters which are widely used in chemical and petroleum industry for high accuracy mass flow measurement and can be configured to also output density information based on the resonant frequency of the vibrating flow tubes. Ultrasonic waves are passed from a source, through the fluid of interest, and into a detector which measures the acoustic spectroscopy of the waves. Fluid properties such as density and viscosity can be inferred from the spectrum. Radiation is passed from a source, through the fluid of interest, and into a scintillation detector, or counter. As the fluid density increases, the detected radiation "counts" will decrease. The source is typically the radioactive isotope cesium-137, with a half-life of about 30 years. A key advantage for this technology is that the instrument is not required to be in contact with the fluid – typically the source and detector are mounted on the outside of tanks or piping. . The buoyancy force produced by a float in a homogeneous liquid is equal to the weight of the liquid that is displaced by the float. Since buoyancy force is linear with respect to the density of the liquid within which the float is submerged, the measure of the buoyancy force yields a measure of the density of the liquid. One commercially available unit claims the instrument is capable of measuring specific gravity with an accuracy of ±0.005 SG units. The submersible probe head contains a mathematically characterized spring-float system. When the head is immersed vertically in the liquid, the float moves vertically and the position of the float controls the position of a permanent magnet whose displacement is sensed by a concentric array of Hall-effect linear displacement sensors. The output signals of the sensors are mixed in a dedicated electronics module that provides an output voltage whose magnitude is a direct linear measure of the quantity to be measured. Slurry is weighed as it travels through the metered section of pipe using a patented, high resolution load cell. This section of pipe is of optimal length such that a truly representative mass of the slurry may be determined. This representative mass is then interrogated by the load cell 110 times per second to ensure accurate and repeatable measurement of the slurry. Helium gas has a density of 0.164 g/L; it is 0.139 times as dense as air. Air has a density of 1.18 g/L. Blood normally has a specific gravity of approximately 1.060. Vodka 80 proof has a specific gravity of 0.9498. ^ Density – VEGA Americas, Inc. Ohmartvega.com. Retrieved on 2011-11-18. ^ Process Control Digital Electronic Hydrometer. Gardco. Retrieved on 2011-11-18. This page was last edited on 14 April 2019, at 04:12 (UTC).